I was never a huge Tom Clancy fan, but I agree with the man that "...when you stop learning, you die." Those brain cells need exercise the same way the rest of the being does.... 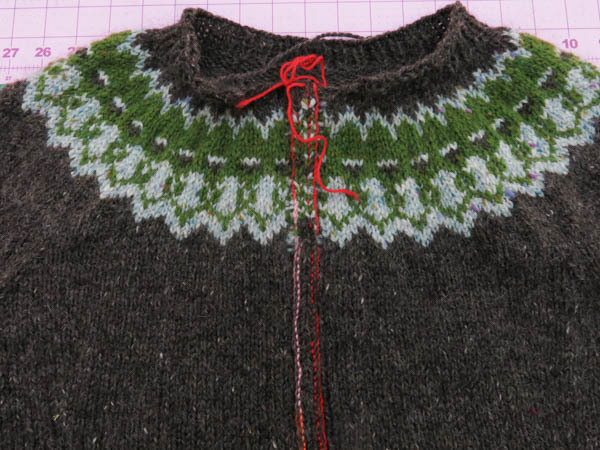 I started a Strokkur pullover, a color work sweater designed by Ysolda Teague, last Winter. It was a bitterly cold Winter and I had taken a steeking workshop when Mary Jane Mucklestone had taught here at AGOS that inspired me to try my hand at color work. And steeking. I pulled some Peace Fleece out of my stash, did a little swatch and plunged in. As is often the case with late Winter projects for me, I did not make enough progress before the weather began to warm, so the project was put aside. I picked it back up this September, knit about six inches on the body and discovered that my gauge was off, too much to live with. So I frogged it and started over (ugh) and pushed through so that while we were in Montreal over Christmas I actually got to the icing part of the project-the color work yoke. It was a little painful on my arthritic hands, but boy, does it look good. This brought me to the crossroads that was the steeking portion of the project. I had been mentally steeling myself for this eventuality for over a year. So I was pretty much prepared. In addition to Mary Jane's class I had read everything I could find on the subject. With Mary Jane's words in my head, I crocheted along both edges of my steek with a contrasting sock yarn. And then I got my scissors, and I cut between those two lines of crochet. Just like that. Just like that, I added another tool to my arsenal. It was truly that simple. I followed the directions. I had books and magazines as research. I focused on the task, I paid attention to what I was doing. And then it was done. Now I need to pick up stitches and knit on my button bands, find myself some buttons and I'll have a warm and stylish color work cardigan. Just like that I have learned a new skill. Must admit I want to start right in on another yoked sweater. Kate Davies' new book on Yokes is quite inspiring. But that would require buying new yarn, and I have all sorts of beautiful yarn in my stash that I want to knit up. So I will wait a spell before I start another Fair Isle project. I can guarantee you that there will be more though, because it is addictively fun and I need to keep practicing my new skill. I was particularly pleased with the shaping in Ysolda's pattern so I am inspired to make another of her garments. The Fancy Tiger ladies are doing a January Knit Along with Ysolda's Blank Canvas pattern. I think I will join in with some Jo Sharp DK in a heathery Indigo from the stash.... Basic pullovers have gotten some heavy rotation in my closet lately. At this time of year, many in the blogosphere post year-end wrap-ups or New Year plans. I've never been much for resolutions. They often feel doomed, by being a projection of a desired change, inherently unattainable... I have been feeling my years lately, in a good way for a change. I can remember all those early years of sewing with the expected mistakes and frustrated makes. There were years when I was in a groove and being productive. And then there were years (!) when I didn't even sew a lick, instead focusing on my knitting, because I just couldn't get the mojo to work for me. Knitting inadvertently taught me about sewing. With the guidance of the supportive and wise words of Elizabeth Zimmermann I learned to become the boss of my knitting. Some times that meant taking out knitting that wasn't working and re-doing it. There was one particular Debbie Bliss pullover that I literally knit entirely, and frogged entirely, twice. And then decided that the yarn I was using wasn't right for the pattern. I believe that was the moment I discovered top down knitting... The point here is the persistence and the practice, and the constant learning, and growing that come with a craft. It is not a zero sum game. Some projects may fail their intended purpose. Hats don't fit you, they can be given to another. Skirt is too short, give it to another-think of it as a muslin. But each one of these experiences makes you who you are. Each less than perfect outcome is still another skill learned. I read somewhere, when you start sewing you're going to ruin a bunch of fabric, just get used to it. I have ruined my fair share. And I have learned to make a muslin, because, even if it is another step between me and that fabulous dress I'm going to rock, it is a step that ensures I will truly rock that dress instead of abandoning it to the back of my closet in shame. When I went back to sewing after having learned how to frog and re-knit, I was a better sewist. I had learned the patience to take out what wasn't working before it was too far into the construction process. I love that perspective that I have gained from being on the planet, frogging knits, ripping seams, and making with my own two hands for so many years. I am looking forward to more practice of those skills, and to learning some new ones. I am setting out to try some quilting patterns instead of my usual improvisation winging it. Perhaps some paper piecing? Do you have any skills you're eager, if nervous, to try? Perhaps you should come in here and try them out with me.....?